I was facing a very hard choice on my day off today: take a nice bath or go get a massage. As you can see my sweet body decided on a bath. I’m in the process of letting go of my mental control freak. In my opinion we are here on this planet to enjoy our embodiment. Why else would we go through so much trouble to get a body?! My body first asked for Epsom salts. OK, sweet bod, you’ve got it!! I enjoyed a jet stream massage and felt my body come alive even more. After a while my body requested bubbles. One of the perks of having a jet stream bath is quick and easy bubbles. Yes body. On it body. Here you go body! 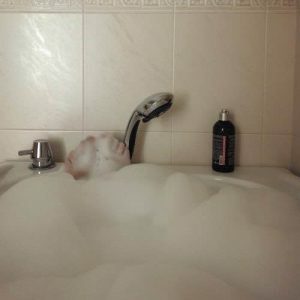 Did you realise that there is a big difference between bath bubbles and bath bubbles?! I for one didn’t and I must share my joy at feeling these satin bubbles of delight all over my body. It is simply divine. What greater ease and joy can we all experience with our beautiful bodies when we are willing to let go of our control freaks?